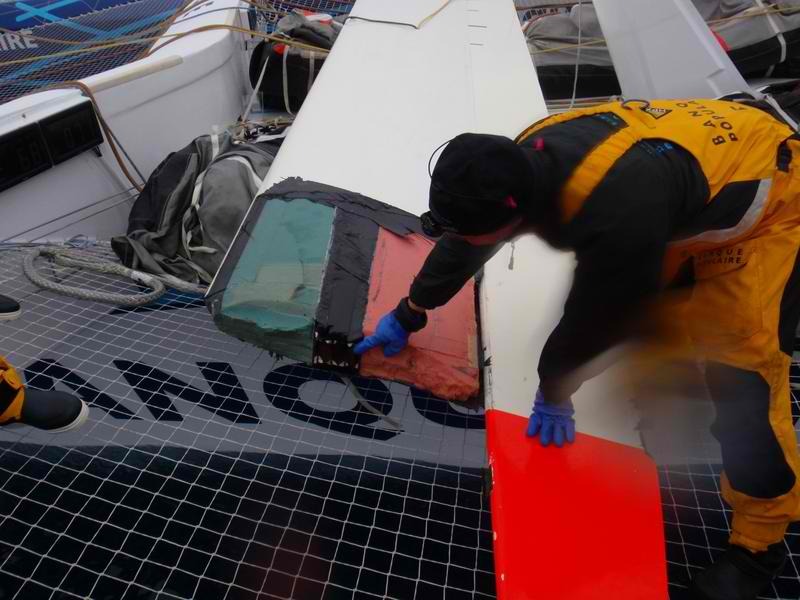 With a lead of 324 miles over the reference time, the Maxi Banque Populaire V was handicapped for more than 48 hours by a damaged daggerboard due to a collision with a UFO*. 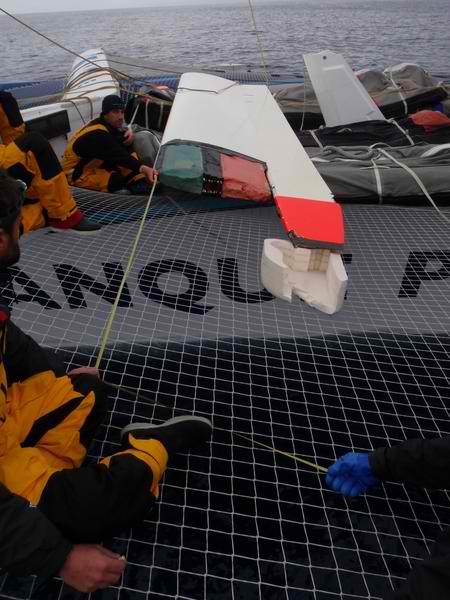 The crew have tried everything to repair the broken piece and resume their round the world tour. However, after 24 hours of intensive care, Pascal Bidegorry and his men must face the facts: it is not possible for them to continue this journey with a daggerboard that does not fulfil its potential when one looks closely at the long upwind voyage ahead to the Kerguelen Islands. After fourteen days of sailing that has seen an impressive performance from the boat, the fourteen men on board are therefore forced to quit in their first record attempt of the Jules Verne Trophy. "Yesterday, we spent the day sawing the end of the damaged daggerboard. We managed to clear a good part of it and scraped inside it to make it fair. Right now, the guys are trying to fill it in with whatever they find. Then we will have to fair the outside. The boat is a true composite workshop at the moment, which is not ideal at 46 ° south, in the cold and permanent fog. We are left with two meters of daggerboard instead of the usual 5.80 meters. At the scale of a boat like ours, it does not help performance and we have a lot of upwind conditions ahead to get up to the Kerguelen Islands, conditions under which the total length of the daggerboard is essential. We have been working on it for two and a half days and despite all our determination, we fully realize that we cannot put it back before noon tomorrow at the earliest. We need to be objective, we are racing a record and need to be competitive. Not carrying on is more than obvious today, especially since we know that there are a lot of upwind conditions awaiting us. We cannot sail as fast as we wanted in the south. We have left the boundaries of what is the essence of our mission. We have thus decided to leave some time for the team in charge of the "yard-work" to finish repairing the damage properly. Then slowly but surely we will return to Lorient. We are big boys, we came here alone and we will come back under sail. For now, we are still heading east. We should have a wind shift within a couple of hours to make a northern route. We should get very soft conditions within 24 hours, which will allow us to finish the repair. Then we will start again in the trade winds, downwind to the Doldrums. " The disappointment and frustration of the Maxi Banque Populaire V’s crew and of Banque Populaire itself are inevitably strong today, but everyone knows that this decision is right, as there is still two thirds of the world left to sail around in this attempt. After leaving Brest on Saturday, January 22, the Maxi Banque Populaire had performed well, confirming its potential as a hunter of records. Nevertheless, on the night of February 2nd to 3rd, what is suspected to be a whale destroyed Pascal Bidegorry and his men’s hopes in the South Atlantic, a few hundred miles away from the Cape of Good Hope. Forced to retire after two and a half days spent trying to find a way out, they do not intend to stop and will therefore head north to their Lorient base Lorient, a trip that will take 18 to 20 days. "I am determined to do this round the world and to beat that record. We have both a reliable boat on which we worked really well and a sporty degree of quality that makes me think that the Maxi Banque Populaire V deserves so much better than what we are offering it today. We must continue to work for the future. " If this Jules Verne Trophy attempt ends this Saturday 5th February, we must recall that this was the first attempt of the giant trimaran bearing the image of the Sailing Bank, tenaciously committed forover 20 years in offshore racing and its mechanical hazards.